A heated mattress pad avails you of many benefits for sure. One of the best advantages of heat is its healing power. Those who have a poor sleeping should check out the best-heated mattress pads given below. Although it is the best option to buy in winters, you can prefer it if you have muscle soreness, back pain, and even Arthritis. From sources, it is found that approximately 54 million adults of US alone are suffering from doctor-diagnosed arthritis. Electric mattress pads especially help in providing some relief from specific pains. However, it is an intelligent plan to choose a heated mattress pad, because the thing is really giving you many merits and no demerits. You can sleep safely and comfortably only when you have chosen the best-heated mattress pad. So, here’s a buyer guide mentioned for your great help. Here are some tips for choosing the electric mattress pad. • Enquire about the electrical safety of each pad you wish to buy. • It should not catch fire. • Always go for ETL or UL certified product to ensure proper safety. • Prefer auto shut off, for if you would forget to turn it off. • Take a look at their controllers and pick up the one which is suitable for your vision. Like, some controllers have very small numbers imprinted on them. • Do not buy too complex mattress pads. In short, they should be easy to handle. • Ask for any specific instructions for a particular category like infants or old age people or you can also enquire about the company relating to your disease. Our top pick is Serta Electric Mattress Pad for your cold winters. It has all the required features that you need to consider. Two controllers for individual control makes it more fascinating and at the same time, unique. 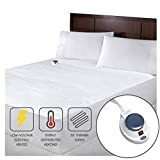 As its controllers are loaded with preheat features, 10 heat settings and auto shut off settings of 10 hours, this Serta Mattress Pad measures approx. 72’’ by 84’’, which is perfect to fit your 18’’ mattresses. Moreover, this is ETL certified mattress pad, a perfect pick for you. You can choose to place connectors wherever you wish. • 19’ controller cable for easy placement. • Gets too hot when set on high settings. It is advised to set it at less than high settings. If you wish to set it at high settings, so you should change it a few time later. Sherpa’s quilted mattress pad can prove to be one of the best options if you wish to buy a more soft touch pad. It can be easily fitted to 22’’ mattresses. You will not even notice it’s ultra thin wires. It has an amazing soft cozy top to be noticed. As shown in the picture, it has controls on either side of bed. Digital controller has 10 heat settings and auto shut off. It is machine washable as well. • Dual control available for queen and king size mattresses. • Whole mattress needs to be set on heat. It is recommended to put the other side at low temperature if you wish to sleep at only one side. 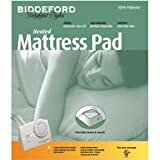 This is Bidderford’s another range of affordable mattress pad with a digital controller. They have updated their analog controller to digital controller. It can be your ‘Exactly what I needed’! From its therapeutic heat, get relief from your body pains. Its digital controller also includes 10 heat settings and auto shut off feature. However, you can prefer this one as a budget friendly mattress pad. • Connectors are placed near your foot. So, it is always better to consider your sleeping position before turning it on. Still looking forward to a more affordable option? Just take a look at the better features of the low voltage heated mattress pad by SoftHeat. Maybe, it is the one you wish to buy. Though they are providing single control, it is loaded with preheating features for cozy warm sheets along with an auto shut off and usual heat settings. It is also one of the popular online selling range. 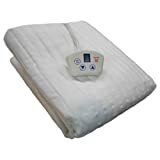 • Low voltage budget friendly heated mattress pad. • Pre heat features and ultra thin wires. • Inbuilt overheat protection measure. • Not suitable for high voltage like 220 volts. • Queen and King has dual controls. It is preferred to plug it in a voltage ranging 100-120 volts. 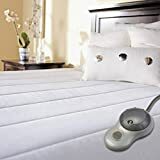 Now, it’s time for Sunbeam, one of the Top 10 Heated Mattress Pad of 2019, we have researched for you. This mattress pad comes with an ultra soft top made with 100% polyester. You can prefer it if you are looking for Sunbeam affordable option. However, inbuilt wires may be noticeable, though not uncomfortable. It is filled with features like auto shut off, 10 heat settings as well as preheat. 18’’ mattress is the perfect size to fit it on. • Affordable and popular Sunbeam range. • Dual control available with queen and king size. • Push buttons on the controller for its easy operation. • Wires may be noticeable, though not uncomfortable. It is advised to adjust your sleeping position as per the connectors so that they will not be an irritating one for you. Being a unique feature of 30-day money-back guarantee attracted a lot of buyers. Well, there is one year warranty. Electrowarmth Mattress pad, totally made in the US can be the exact one for you. You can prefer it for its unique design. Get rid of irritating coils anymore! Being available in different sizes, it allows you rest in deep sleep. Regarding its warranty, you can contact manufacturer’s customer care through Amazon. • Exclusive 30-day money-back guarantee. • Dual controls available for queen and King, loaded with usual features. • More heat wires below your waist area. It is one of the best options to keep your legs warm. It comes in the category of Sunbeam’s wireless controller premium range. Its 3 zone heat technology is remarkable. 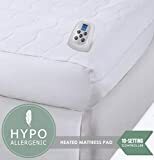 This premium soft mattress pad includes a therapeutic heating system for the neck, back, legs and foot aches. Wireless controller with thermofine technology to auto adjust for heat control, captures it more. Though you should consider it if your body is having more pains, but it is also preferable if you wish a wireless controller. • Auto shut off with preheat features. • Thermofine technology for adjusting heat control. • Wireless single controller with dual zone. • 3 years warranty and 3 heat zone technology. • Premium Soft and ultra thin wires. Another SoftHeat’s soft range to go on. This mattress supports ultra soft micro-velour fabric. At the most, it is even power efficient operating at less than 25 volts and a preheat feature is also included in its dual control system. It is also among the popular selling range. Its design may not beat the Sunbeam’s premium range, but it definitely softer as mentioned. You will feel stable heating from head to toe. • Auto shut off controller with 10 heat settings. • During initial warming, it may use upto 120 watts. • A very simple, but elegant. Power consumption depends upon heat settings that you choose, but only initial warming needs that much power consumption, otherwise, it will be low ranging 20-33 watts. Still looking for a better option? Here is Sunbeam’s Waterproof Mattress pad at an affordable rate. It has a single controller with two heat zones. Do not worry of water spilling on a mattress pad. Water will not enter your mattress and destroy it. Additionally, it is a premium soft range with 100% cotton top. This is the best option if you are looking forward to buying a waterproof mattress pad. Kids are at a great priority before making a decision. • 10 heat settings with auto off function. • Single controller with dual zone. • Connector located on top. They have provided dual controllers with queen and king size mattresses. Here, it is again advised to see to your sleeping position to get maximum comfort. This is the last best option to buy Sunbeam’s budget-friendly range with exciting features. Being a perfect fit for 18’’ mattresses, its dual controllers are included with features like auto shut off and 10 heat settings. The inbuilt wires are even not noticeable with an ultra-soft cotton top. It also comes with a ThermoFine technology to control consistent heat. Though it is not loaded with preheating features, but it may prove to be your best budget-friendly piece. • Ultra soft and ultra thin wires. • Plug located on the top. Sometimes, to have a connector on top is a brighter side for the ease of operation. 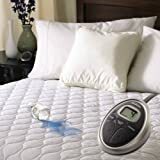 Based upon your overall requirements, choose among the Top 10 best heated mattress pads in 2019. Note* All the mattress pads mentioned above are either ETL or UL certified to ensure your proper safety.